Purchasing a garage? 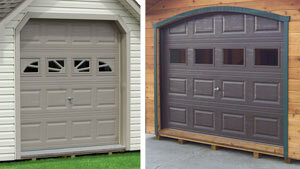 You have options for the garage door, too! Purchasing a standard shed, but need easy access for large items like lawn mowers, atvs, snowmobiles, or pallets of supplies? 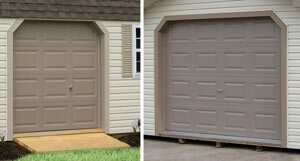 Depending on the size of the shed, you can add or upgrade to a garage door to make getting in and out easy. We even have a small 6'x6' garage door for in smaller sheds. Let extra light in by adding a row of windows to the door. 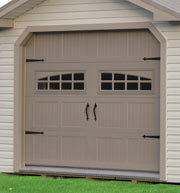 Add an electric garage door opener and never have to get in and out of your car to open and close the door!